Mmmm olives….sun dried tomatoes…..pancetta…and…..drool….goats cheese. How could I not combine them? That would be tantamount to sacrilege. I wanted to make a quiche/tart but I didn’t want the carbs and butter in the shortcut pastry or the heavy cream. I haven’t been to the gym for a few weeks while on holidays, so I was trying to be good for my first week back. Well…consuming goats cheese isn’t technically being good, but when you are only eating 1/8th of this recipe then it works out ok I presume. 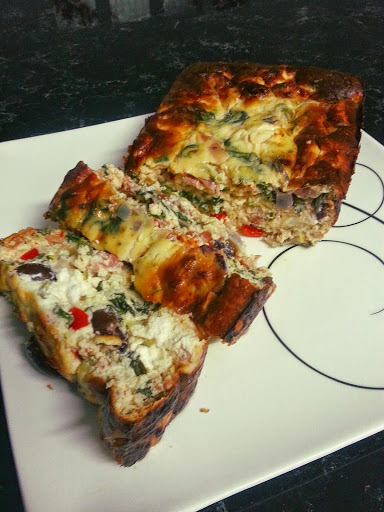 I wanted to effectively make the contents of a quiche in a crustless pie/bake/loaf form. And it worked! I was inspired by an amazing Baked Savoury Beetroot and Ricotta Pie from the Lab Kitchen which I have made for myself and recommended to my mum to make for a vegetarian friend – both times it was yum. The Lab used bran on the outside of her pie instead of pastry, which works like a charm to hold it together. I wanted to find out whether I could do this without anything on the outside or not, and it did work! Serve this in shortcrust pastry as a tart. Add heavy cream to make it more of a traditional quiche. 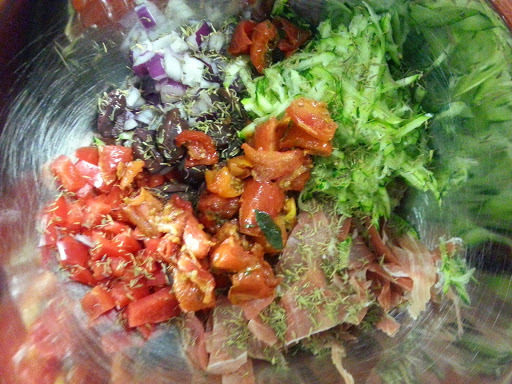 Transform it into a vegetarian dish by leaving out the proscuitto. Or add chorizo, jamon or bacon instead of the prosciutto. Change up the vegetables to whatever you like, eg adding chopped asparagus spears may work. Try feta instead of goats cheese. Top with cheese before baking. Bake in muffin trays or ramekins for individual servings instead of in a loaf tray. Preheat oven to 200 degrees Celsius/392 degrees Fahrenheit. Wilt the spinach and rocket first, then allow to cool to room temperature. I always enjoy seeing how much and how quickly it reduces down. Add all of the dry ingredients to a bowl first, then mix. I could just mix and eat this. Whisk the eggs with the milk, salt and pepper. Add ricotta, cheese and egg mixture. 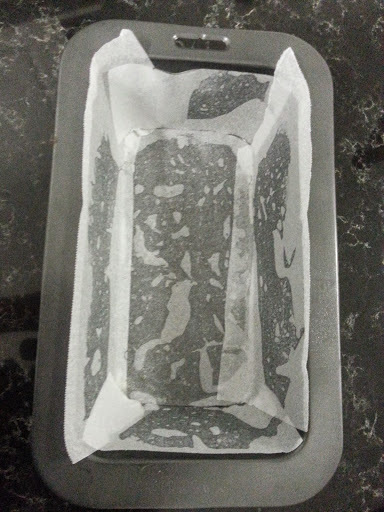 Spray a loaf tin with spray oil, then cover with baking paper. I traced the bottom, cut it to size, then cut slices approximating the size of the walls. You could use any similar sized tin really – round would work too. Pour mix into the tin. 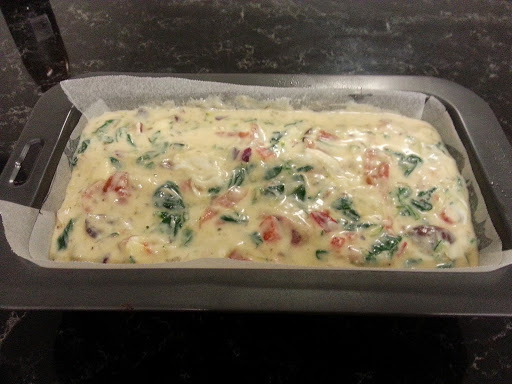 Bake for approximately 45 minutes.Serve (in slices) with a side salad. I’d recommend an either an Italian or a balsamic dressing to go with these flavours. You’ve got to make this. It was so simple and so good. 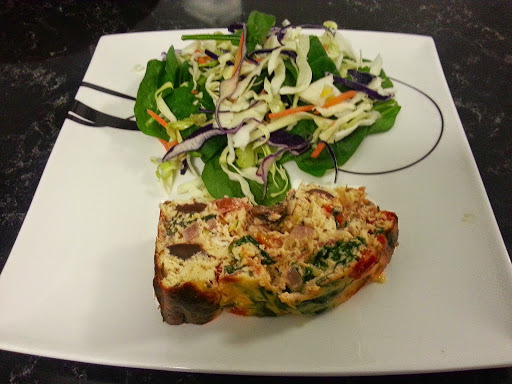 I’d be keen to try it in a shortcrust pastry base quiche-style or cooked portions in a muffin tray next time. The flavours work so well together. The sun dried tomato, olives and prosciutto add saltiness, the rocket brings a peppery flavour, the capsicum brings the sweet and the goats cheese is the star. This will certainly make more appearances in our household. The flavours infuse overnight so it is even better on following nights.